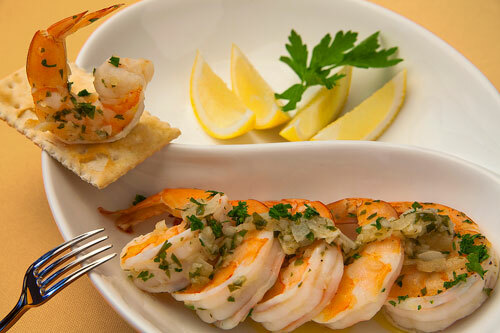 The garlic salsa (with which the shrimps are seasoned) basically consists in the combination of garlic with butter. In this combination the softness and the delicacy of the butter compensates the strong point and spicy of the garlic. Then this salsa is mixed with the shrimps’ sweet and mild flavor, creating a balanced and sensational flavor . We recommend serving this dish as entree plate since its flavor, slightly spicy, helps to whet the appetite. Although if you want to serve it as main course serve it with rice , salad and/or beans. The garnishes help to reduce and to complement garlic’s flavor . It can be thought that is very difficult to make this recipe but the truth is that it doesn’t have any complication. It is very important to use butter in this recipe and don’t substitute it for margarine or vegetable shortening as the butter gives a fine and pleasant touch to the dish. Also try to use fresh parsley because it gives flavor, freshness and aroma to the dish. With the dried parsley these results are not achieved. The dish will be ready in 15 minutes . This recipe is for 4 persons. Separate the garlic cloves from 1 garlic head and peel them. To peel the garlic cloves in a simpler way, just crush them with a knife and then it will be very easy to remove their skin. Put all the garlic cloves that were peeled in a blender. 1/2 Butter bar (1.5 oz). Peel 28.2 oz of shrimps. Remove the head of the shrimps that were peeled and the vein that is located in the upper back; then set aside. Finely chop 1/4 of an onion and 5 parsley sprigs; then reserve. Melt in a saucepan over low heat 1/2 butter bar (1.5 oz). Be careful about not burning the butter because its flavor turns bitter and it will no longer serve to cook the dish. Add in the saucepan the onion that was minced and fry it for approximately 1 minute, until it looks a bit transparent; stir regularly. Pour in the saucepan the garlic salsa that was prepared and cook it for about 2 minutes, until it thickens a little; stir occasionally. Incorporate in the saucepan the shrimps with the ones you worked and cook them for about 3 minutes, until they are lightly cooked; stir regularly. The Parsley that was minced. Mix the saucepan ingredients and cook the shrimps for about 4 more minutes, until they are moderately cooked and the salsa has thickened; stir regularly. Careful! Don’t cook the shrimps for a long time because their texture becomes rubbery and difficult to chew. Tip: Accompany your garlic shrimps with some crackers , you will love this simple combination. Variations: Taste the shrimps in its spicy version with the devil shrimps or in its fresh version with the shrimps to the vinaigrette. Did you like the Garlic Shrimps? If you have problems while grinding, blending, chopping, shredding or even kneading ingredients. You don’t have to worry anymore, the “Cuisinart Food Processor" will do all that for you and more... It really is a beauty. Now chop like the chefs with the “Victronix Swiss Army Knife". This knife is sharp, it has a good grip and you can sharpen it as many times as you want. All your cuts will be perfect! If you like good grips. The “OXO Lime Squeezer" has the most comfortable grip that there can be.